To say I am overwhelmed would be an understatement! Thanks to whoever it was who nominated me to be Spotlight Stamper of the Month. I have been stamping and making cards for 15 years now. My daughter went to the USA for work with her husband and I inherited her stamps, LOL . How lovely.! I had seen Spruce Goose stamping back in the 1980’s and loved it then, but I was doing study so of course stamping was put on the back burner. I have been a crafter most of my life. Knitting and crochet in earlier years as it was easy to pick up and down with a daughter. Also being on a dairy farm, and time was very short , then as I said studying for my VCE when I was about 40 which was enormous fun. Huge life changes when I was 45. I embarked on a new life with a new man who indulges my love of stamps, etc. He is my fiercest critic as well, although a fair one. My favourite stamp company for oriental would have to be Artneko, but also Onyx Impressions when that was operational. I haven’t seen them around now for some time. Again thanks for taking the time to read this scribble. I hope you enjoy my cards. Congratulations, Liz. So glad to see you back in stamping action! Congrats Liz! Looking forward to seeing more of your beautiful art work. Oh my gosh, Liz. Your pergamano parchment cards are marvelous. I wish you lived near me to teach me how to make such gorgeous cards. We have missed you and I’m so happy to see you and your art here at OSA for the March SAM. Hopefully you will have time to share more of your art with us this year. CONGRATULATIONS. STUNNING cards! Thank you so much for sharing…looking forward to seeing more of your work! You are well deserved as the March SAM….enjoy your time in the spotlight Liz!!!!!! 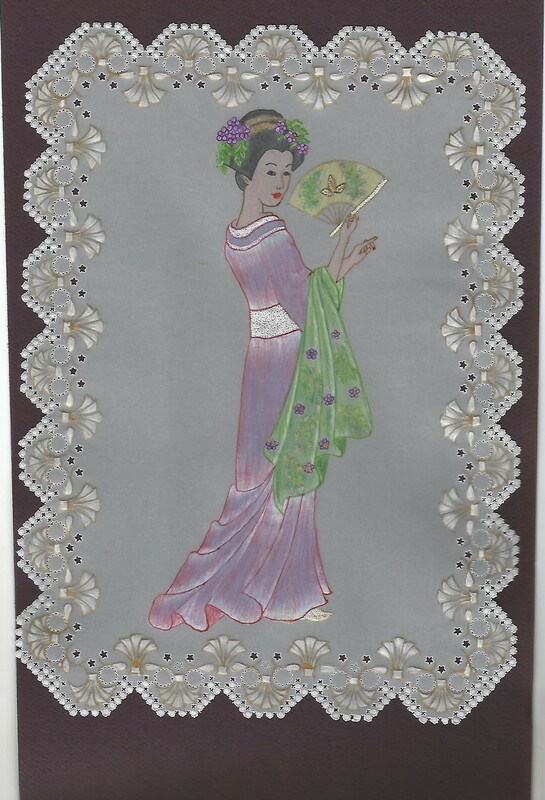 Wonderfull parchment card with the Geisha, like the other cards tooo. Congratualtions Liz on being SAM this month…enjoy it all.